Blog — Quilt Photography Co.
Galaxy Stars is a pattern which includes 13 paper-pieced star blocks and 3 quilt top designs. 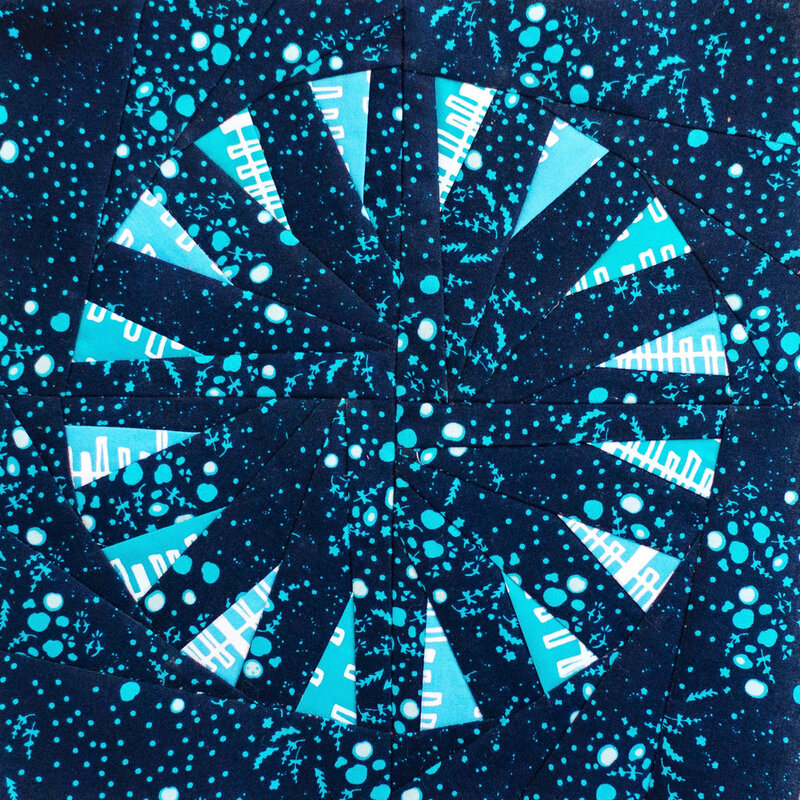 Featured here is the first quilt top design, “Night Sky”, with a layout that does not conform to a grid - instead, the stars are scattered about the background. This twin size quilt is made primarily with Alison Glass and Karen Lewis fabrics. It is quilted with large, concentric circles, and backed with some beautiful Tula Pink fabric. You can find the pattern for this quilt here. Geoweaver, this pastel beauty by Lindsey, is inspired by her love of crocheted afghans. She packed it full of gorgeous Kona solids, and backed it with a gentle floral print that weaves together all of the colors from the quilt top. The pattern is available here. It’s beginner friendly and would work well with any color palette! Lindsey’s quilt is finished with beautiful free motion quilting in a delicate, floral-inspired design. Caorle created this gorgeous, improv-looking quilt of triangles with a surprising method twist - she paper pieced them! This makes it the perfect pattern for the person who loves the look of improv, even if it doesn’t come easily to them. You can check out her pattern here. Carole put together this version with vibrant neons, and pops of a black and white print. The triangular quilting pattern and binding accents pull together funky, light-hearted, and modern, all in one quilt. We’re back today with another beauty by Meghan - this one full of stars. Stars that simply sparkle. The use of higher contrast prints, along with a variety of values, is what gives the fabulous sparkle effect. These stars are a traditional Carpenter’s Star, and can be made with either flying geese or half-square triangles, depending on your preference. We also included a crumpled up shot of the backing, because that floral print is to die for. Brand Ambassador Shelley Cavanna recently sent in this gorgeous quilt, Calliope, for us to photograph. She made it with her very own fabric line, Gloaming. One of my favorite things about this quilt was seeing just how exactly it matched the digital mockup - it represented her line perfectly. My next favorite thing about this quilt was how interesting it was from every angle - draped, folded, zoomed in, and as a full quilt. Some quilts are really best viewed flat and straight on - but this quilt will look fabulous in action, no matter what it’s doing. You can make your very own version of Calliope by purchasing the pattern here. Enjoy! Cheryl designed this quilt as an entry for the Michael Miller challenge for QuiltCon 2018. "My idea was to create a "pop" with the Our Yard prints on a monochromatic, minimalist black and white quilt." She template pieced the quilt, and added plenty of black negative space to give the blocks some breathing room. She straight line quilted it meticulously with white thread. The level of craftsmanship is stunning; every flaw shows with this type of quilting and we didn't see any! This quilt is jam-packed full of prints from all of our favorite modern fabric designers - Heather Ross, Cotton and Steel, Anna Maria Horner, and more! Meghan made this quilt using the Tessellation pattern, by Alison Glass and Nydia Kehnle. The original quilt was made in all solids, and this is the first print rendition we've seen. It's incredible, isn't it? She kept the corner triangles as a fun flourish, with a cream binding and simple quilting to keep the focus on the quilt top. Folding, draping, and crumpling up this quilt changes the look drastically, making it look almost like a different quilt depending on how you lay it! She backed it with a mustard floral print to tie everything together. Brittany wanted to design "a simple, vintage style to reflect something my grandparents would've proudly displayed in their abundance of Christmas decor." She nailed it with this quilt! Brittany sent this to be quilted by Knot and Thread, and we documented the finished product. You can now purchase the pattern to make this quilt yourself! We think it would look fabulous in almost any color. Ali Jensen created this sweet baby quilt for the RJR "What's your shade?" blog hop. You can check out her post here. It reminds us of cupcake frosting ;). The simple blocks and soft color palette combines to create an absolutely perfect baby quilt. But if you wanted to make it in bolder colors, or prints, you can buy the pattern in her shop to create a completely different look. It was quilted by Crinkle Love. This lovely quilt by our Brand Ambassador Brittany Lloyd is filled with soft pastels, pops of black triangles, and scrunchy texture from straight line quilting. I absolutely adore the way it looks draped! It's a baby / throw size, and would be the perfect compliment to a modern nursery or living room. The variety of simple geometric shapes combined into one quilt top creates a quilt that is interesting to look at from a variety of angles, folded or unfolded. Pattern available here, original quilt for sale here. Brittany shared that this design was "inspired by the rich Native American history in the mountains of Western North Carolina".